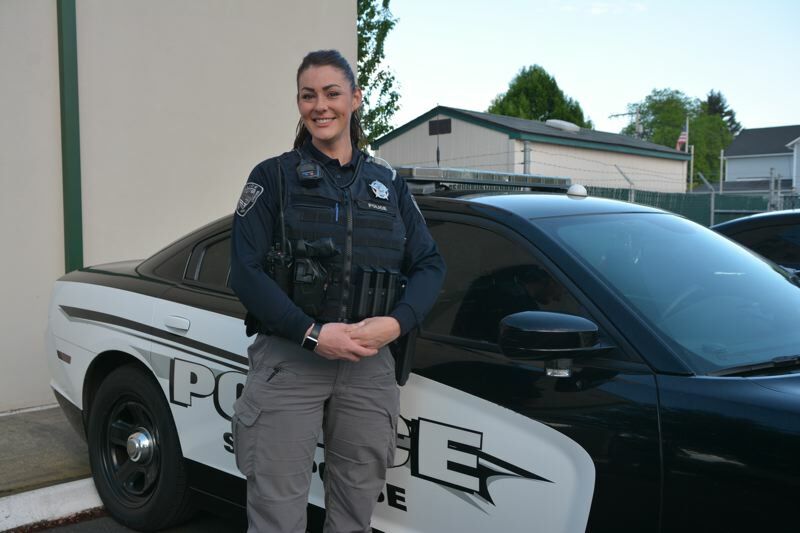 Hailey Holm may be the newest to don the Scappoose Police uniform, but she's a veteran within the department. Holm recently transitioned from her role as a records technician at the Scappoose Police Department to an officer on April 16. She's the newest hire, but she's no rookie. Holm started at Scappoose PD in 2010. After roughly eight years behind the desk, she got inspired to pursue life behind the badge. "When I started working for Scappoose, I guess I didn't know what I was getting myself into," Holm says. "It's given me a huge eye-opener for the passion that I have for helping people and working with people." After years of reviewing police calls and interacting with officers, she decided to make the jump. "I believe the admin job did inspire my decision, and I think I've worked for years to challenge myself to have the courage to become a police officer." In her new role, Holm will be policing the area she grew up in. A 2004 Scappoose High School graduate, Holm grew up in Warren and still calls Columbia County home. She says she looks forward to playing a role in public safety. "I've always had a passion for community and I think working within my community is more special," she says. She's already been training with officers, riding alongside them on night shifts, but the hard work is still ahead of her. This summer, Holm will embark on a 16-week academy in Salem and then have to complete training specific to her new department. She'll also need to become certified by the Department of Public Safety Standards and Training. In the meantime, she's working graveyard shifts alongside other officers to get hands-on training. On a Wednesday evening, she's riding alongside Officer Travis Killens. "Hailey's already way ahead of schedule," Killens says of his partner's background knowledge and experience with protocol. "She already has a good idea of what's required in there." Killens says Holm's background in the department's software system will give her a major leg up. The officer admits she's a little nervous, but her demeanor would never reveal it. Police work can be challenging and dangerous, but for Holm, the trade-off is worth it. "You're making an impact on the community you work in or live in," she says of law enforcement. "You have the opportunity to help people, help people make the right decisions, maybe even help save a life. The job's never routine."